This weekend marks the 6th annual Jane's Walks (historical guided walking tours in honour of Jane Jacobs) in neighbourhoods across the city. We've got our own local Jane's Walk here called "The Other Danforth" (info and registration can be found here) led by local writer and urban historian (and one of the most interesting people I know) Stephen Wickens. Pioneer had a chance to sit down with Stephen and chat about our Danforth. Q. 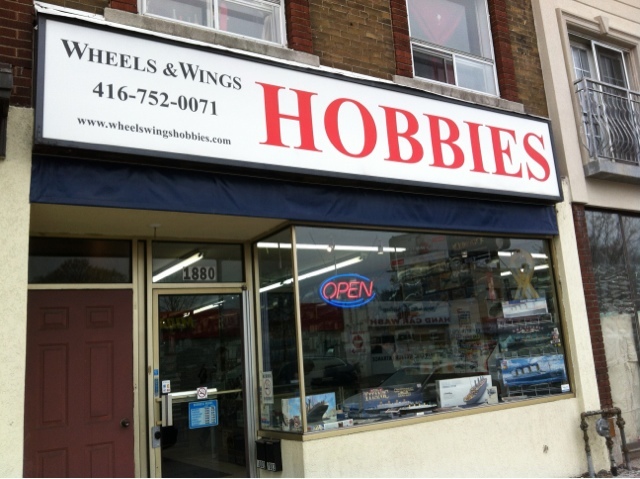 How did your interest in the Danforth area begin? I grew up in the Beaches and when I was young my father used to tell me about his streetcar ride along the east part of the Danforth. He would describe the crowded sidewalks and bustling store fronts - a far cry from what we see now. The Danforth (specifically Woodbine and Danforth) was the place to go for shopping. It was almost like an exotic destination, away from the insular community in the Beaches. 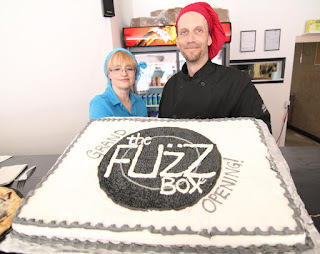 My wife and I settled into the neighbourhood about ten years ago, to be close to the subway. I've always been interested in writing about urban affairs, so it took off from there. Q. If you could name one Torontonian as your sort of role model/urban affairs super hero, who would it be? Jane Jacobs is a very pivotal figure in my life. She was ahead of the curve when it came to thinking about urban planning issues. I consider myself lucky to have been able to meet her before she passed away. That was an incredible experience! Q. What is your favourite story/urban legend about the Danforth, that people might not have heard before? The Dorothy Cox story is pretty cool. When the Robertson Motors showroom at the corner of Parkmount and Danforth was demolished in 1995, they found her body encased in concrete. Her disappearance in 1943 was big news. She was last seen one evening at the Linsmore Tavern and then never seen again. They were able to confirm the identity of the body by DNA testing with one of Dorothy's surviving sisters. An interesting twist to the story came when they tried to do a DNA test with her two sons. Surprisingly, there was no match, so her sons (both in their mid-70's) discovered that they had been adopted. In Dorothy's case though, the murder is still unsolved.......although it's believed that her husband was working construction on the RM building at the time of her disappearance. Q. What do you think the future of the Danforth is? The Danforth will almost certainly become a place facing development pressure, especially in the spots closest to the subway stations. Much of the development can benefit the area because more people on the street as residents or workers coming to the area for office employment, will make a greater variety of businesses viable. But we'd better have an idea of what we want and what we don't want or we'll end up fighting absurd heights and inappropriate densities. Q. What property along Danforth do you think is most pivotal to our community's future? How the TTC property at Coxwell is used or reused or developed or redeveloped will have a massive bearing on the future of our neighbourhood. Right now, it's an under-utilized dead zone. But it's the site with the greatest potential, especially as it's so close to a subway station. It could bring good density and a vitality inducing mix of uses to the neighbourhood, or we could get something out of scale and problematic. Stephen has been a Toronto journalist for 35 years, and most recently wrote a feature piece in the Toronto Star about the history of our fair city's transit system. His other musings can be found here: worldwidewickens.com. The fab ladies over at Silly Goose Kids sent me the news that they are having an information evening at the store this Thursday the 26th at 6:30. It's for anyone interested in holistic child care and will feature a chat and q & a with some neighborhood professionals including a doula and a pediatric focused naturopathic doctor. Click here for more info! 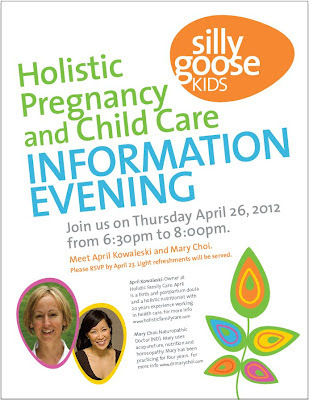 You can also RSVP at info@sillygoosekids.com or 647.341.4400. 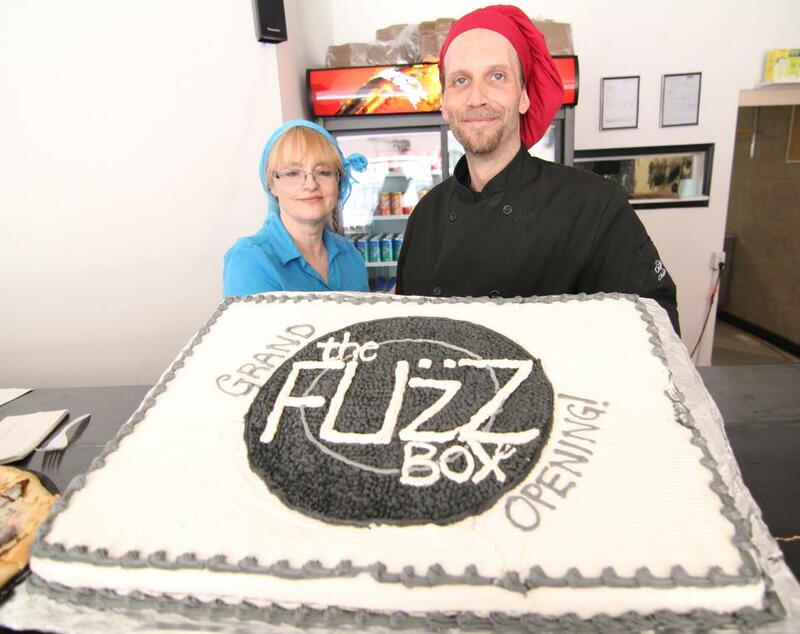 It wasn't the "Free food and drink during Leafs playoff games" banner that drew us in, although we know it's getting a lot of attention along the Danforth, and it wasn't the promise of some hot, gooey pizza either. 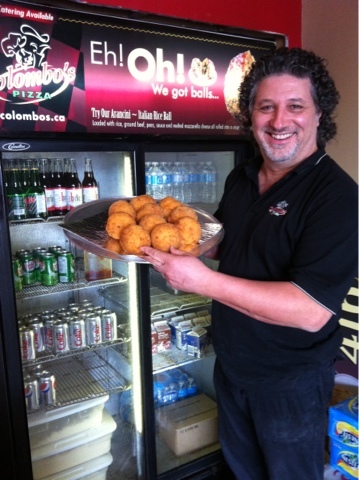 As new Columbo's owner Charlie Pecorella says, 'we got balls' and lots of them. We're talking Italian rice balls, the best rice balls in Toronto and they are right here on the Danforth. Pioneer first discovered Columbo's (1794 Danforth) during our first rice ball adventure that you can read about here. Back then, it was under different ownership and it was a different rice ball. Since Pecorella took over in 2010, business is booming. A new facelift, some new menu items and an almost total revamp of the original rice ball and voila, it's a winning recipe. Rice balls, aka Arancini in Italian, are delicious deep fried balls of rice, cheese, veggies and ground beef. There is nothing better when you've been watching the Godfather and are craving some real 'Italiano'! Pecorella says the secret behind his balls, other than the tangy homemade tomato sauce they are drenched in, is that they are fresh and not frozen and his ingredients are prime. Best part: they are only $3.50! I've tasted these delicacies more than once, and they are now on my top ten list of best takeout ever. Even Daddy Pioneer has been won over (and it didn't take long for Junior Pioneer to become a lifelong fan either!). So, if you haven't ever had a rice ball, stop by and say hi to Charlie and tell him Pioneer sent you. Buon appetito! 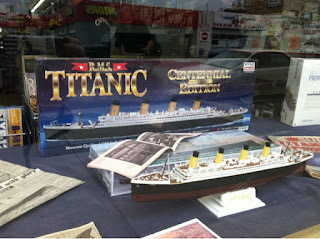 Pioneer is not a Leonardo DiCaprio fan, nor a fan of sailing the ocean blue in a cruise ship, however if Titanic is your thing, this hidden Danforth gem is your thing. Pioneer noticed that Wheels & Wings Hobbies at 1880 Danforth has some great Titanic models in it's window to commemorate the upcoming 100th anniversary of the great ship's demise on the evening of April 14, 1912. These pint-sized replicas would be fun to work on with the young hobbiest in your life, or at the very least let them sink it in your bathtub! Monarch Park is an important community space, but as many of you may have noticed, the park could use some improvement. If your child has ever fallen through one of the the benches at the playground or had to use the washroom while on the monkey bars, you know what Pioneer is getting at. How we can improve the park is on many people's mind, so a bunch of neighbourhood folks from the Danforth East Community Association (DECA) have called a community consultation with residents to get the conversation started. If you're interested in attending, the meeting is this week on Thursday, April 12 from 6:30 until 8:30 at Monarch Park Collegiate. Look for signs around the auditorium to direct you! See you there! A flyer for the mega-store-that-shall-not-be-named arrived on Pioneer's doorstep touting Easter lillies for $6, and while this seems like the deal of the century, I was sure there had to be a better local option. Cruising the Danforth, I noticed a handful of cheap and cheery flower shops and some florists with nice window displays. 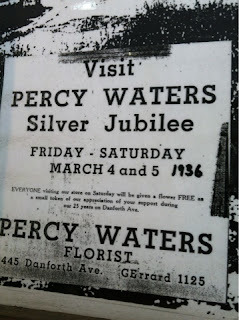 It wasn't until I took a chance and stepped inside Percy Waters Florist at 1360 Danforth that I knew I had found my gem! As I stood outside the doors, I expected to be met with a similar nonchalant nod to what I had received at other local florists. However, as I entered, I was immediately sprung upon by the shop's new store-front manager Scott H. who welcomed me in with an exuberant smile. As we were chatting about Easter flowers, he explained that the store was getting a mini-facelift and some new window displays to fit with the growing neighbourhood. While perusing the gorgeous Easter floral displays, I noticed a historical photo (see left) that blew me away. 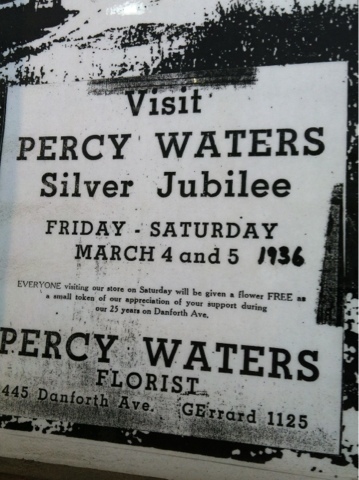 Percy Waters has been in business since 1911 - that's over 100 years of flowers! I asked Scott about the $6 deal and he explained that even though his flowers are a little pricier than the mega-store, his lillies will still be sitting pretty long after the bunny has come and gone. And by the looks of things, this venerable institution may just be here long after we're gone too!